This edited excerpt from Branko’s blog is fascinating. Branko was visiting the town of Stara Tura, in the White Carpathian Mountains on the Czech-Slovak border. When he drove into the town’s main square he noticed a TV crew filming the uncovering of a memorial statue. When it was uncovered, the memorial he recognised that the statue commemorated a Slovak Professor, Jozef Rohaček, and his work. “Professor Rohaček (1877-1962) was born in Stara Tura, but lived and worked in Slovakia, Hungary, Austria, and what is now Serbia, in Vojvodina. As a Lutheran missionary, later pastor and teacher, he spent five years in Kisač and surroundings, teaching Slovaks to write and read in their mother tongue, from 1906-1911. Additionally, while in Kisač, he published the first ever Slovak translation of the Gospel of Mark in 1910. The whole Bible was published in 1934, and was translated from the original languages. The church, however, did not endorse his work… but when the Bible was printed eventually, the first 5,000 copies were sold in less than four months. Such was a hunger for the Word of the Lord in the Slovak language. In Turkey, more and more Muslims are becoming Christians because they have dreamed about Jesus Christ. Recently, the pastor of the evangelical Agape Church in Samsun, on the Black Sea, Orhan Picaklar, reported such a case. A young woman became a Christian after Jesus Christ appeared to her in a dream. But that’s not all: after she had been attending worship services, she brought her mother and her younger sister along with her in the mid-October. This is quite extraordinary, since in general, the families of converts are extremely critical of them. In a prayer letter, Picaklar wrote that after the worship service, the mother even promised to tell her husband that his daughter was now a Christian “at the right time”, so that he would not have a negative reaction. Again and again, there are unexpected meetings with interested people. For example, at the market, Picaklar offers free Bibles and invites those interested to come and see his church. Recently, a woman came by. She told him that she had taken eight Bibles from the market and had given them to women in her neighborhood. She was delighted to have a Christian church in her neighborhood, although she herself was not a Christian. She urged Picaklar to make sure that the church remained in its current place, although there are no plans to move. The church was planted in 2003. A short while ago, there was a baptism ceremony where four people were baptized. About 50 attend worship services each Sunday. The Agape Church is the only evangelical church in the Samsun Region, which has a population of 1.2 million. It is in close contact with the European Baptist Federation (EBF). Picaklar is a former Muslim who became a Christian through reading the Gospel of John. Jeff Fountain, author of the ‘weekly word’ and Director of the Schuman Centre, is happy for us to post a copy of his latest reflections (14 nov 2011) on the future of the EU and the contribution that spiritual/Christian values can make to ensuring a future for the Union. 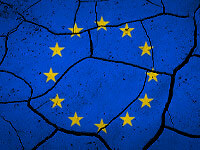 Europe’s financial crises continued this past week, fueling further speculation about the breakup of the Eurozone, if not of the whole European Union. One sign carried by the ‘occupy’ protestors raised the pertinent question: is the game over? Back in 1992, the retiring president of the European Commission, Jacques Delors (pictured), challenged religious leaders to find a soul for Europe. By that, he said he meant a spirituality and meaning. Then he warned, if within ten years that quest had failed, the game would be up. We are nearly a whole decade past Delors’ deadline. Is the game indeed then over? Today’s headlines would convince many that the European experiment is imploding. America, China, Japan and Britain watch anxiously as Merkel and Sarkozy try to rescue the shaky south from drowning in interest rates. Record high rates have finally, finally, dislodged the Italian incumbent from his self-made fortress, to the relief of the markets. The Greek premier has also been pushed aside this past week. Both Mediterranean countries now have interim governments with seasoned European veterans trying to steady the helm. Lucas Papademos in Athens was vice president of the European Central Bank, 2002-2010. Mario Monti in Rome was a European Commissioner, 1995-2004. The ECB probably played a major role in the chaos of the past weeks in a strategic move to dislodge Berlusconi. Interest rates had been suppressed in Italy by ECB’s purchase of Italian government bonds. Last week, these purchases slowed down, allowing rates to spiral upwards until the premier resigned. As the markets opened again this week, the ECB immediately started purchasing the bonds again to stabilise the market. Monti’s appointment will add grist to the conspiracy folk’s mill. For he is a chairman of the Trilateral Commission, a think-tank often accused of plotting for world government and even of having planned the 9/11 attacks! The crisis however is far from over simply with the exit of two ex-premiers. A serious financial faultline runs diagonally from the Irish Sea to the Aegean Sea, with interest rates for government bonds ranging from 7.74 in Ireland and 5.8 in Spain to over 25% in Greece; compared to 2.34 in Holland and 1.88 for Germany. Even France is battling to maintain its AAA credit rating. Small wonder investors continue to be nervous as the media carry doomsday scenarios of the end of the euro and the disintegration of the European Union. For markets are all about trust and perception. So where do we as believers stand in the midst of all this unrest? In the first place, we need to own the problem of Europe. Centrifugal forces are at work today towards the fragmentation of Europe: forces of greed, indifference, populism, nationalism and xenophobia. These threaten to turn the clock back to a Europe of competing nations and alliances. We need to stand up for a Europe as envisioned by founding father Robert Schuman, a community of peoples deeply rooted in what he called basic Christian values of equality, solidarity, freedom and peace. Together we need to call our political leaders to honour these values. For too long we have ignored the warning from Delors which originally was to Europe’s religiousleaders. Surely this is a task far too important to be left solely to politicians! Schuman himself warned in 1958 that the European Movement would only be successful ‘if future generations can tear themselves away from the temptation of materialism which corrupts society by cutting it off from its spiritual roots.’ The identity of a new Europe, he wrote, ‘cannot and must not remain an economic and technical enterprise; it needs a soul’. We, as believers in a God who is Father of all and in Jesus Christ who died for all, need to stand up for a united Europe, a diverse Europe, an open Europe, a compassionate Europe, a justEurope, a sustainable Europe and a peaceful Europe. A Europe that reverts to old nationalistic competitions will only lead back to yesterday’s tragedies. We cannot take the last 66 years of peace for granted. We must continue to move forward together. So, is the game over? YES! …if we remain cut off from our spiritual roots, for we will not find the necessary resources for unity with diversity, for forgiveness and reconciliation, for compassion and justice, for sustainability and peace. NO! …if we only will listen to the fathers.